Okay, close your eyes and imagine a yummy dish made up of crispy crunchy almond slices, salty protein packed pancetta and perfectly wilted Brussels sprouts. Open your eyes because this perfect healthy, hearty side exists and the recipe just a scroll away. 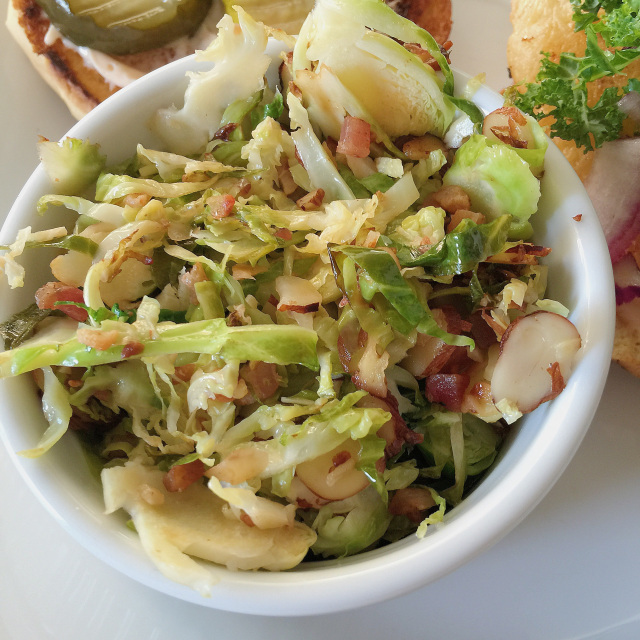 I opted to pair this easy side with my famous crispy chicken sandwich, which I top with a spicy jalapeno pickle slaw. The Brussels sprouts were the perfect balance to the rest of the meal, as opposed to my normal side dish – sweet potato fries. Not only do you get some easy veggie points from this recipe, but it’s chock full of protein too! No empty calories over here. Crisp pancetta in a large deep skillet over medium heat until browned, 3 minutes. Add the garlic and almonds to the fat in the skillet and cook briefly over medium heat until toasted. Add the Brussels sprouts and quickly toss to coat with the hot oil. Sprinkle the red wine vinegar over the sprouts and toss again to coat. Cook, stirring frequently, until sprouts are wilted. Remove from the heat, stir in the bacon and season to taste with salt and pepper.